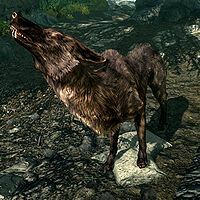 Wolves are low-level, hostile canines found throughout the wilds of Skyrim and SolstheimDB. They can be encountered singly, or in packs of up to three, often hunting other animals. You will often hear their howls before they are spotted. When attacking, wolves will often attempt to circle around behind their prey, and their bite has a chance of infecting the player with Rockjoint. Wolves will not attack beast form werewolves unless provoked. 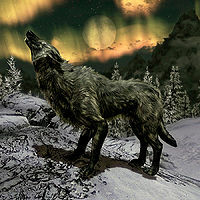 Wolves will stop howling after Dawnguard is installed. This bug is fixed by version 1.5.39 of the Official Skyrim Special Edition Patch.